We recently launched our ‘Ask the Tailor’ competition, inviting you to ask our in-house tailor Juan Carlos (JC) your questions about tailoring. Q: I am soon going to invest in a two new suits, and not having quite the stature of a basket ball player, my question is; what is the best style of suit to flatter a shorter gentleman? A: I’m happy to say that with a few subtle tricks, we can easily get your suit to add inches. The key is to lengthen your silhouette and encourage people’s eyes to travel upwards towards your face, making you appear taller. So the first and most essential thing to consider is the fit - whichever style you choose it’s important to have a close fit in the shoulders, chest, waist and crotch - looser ‘comfort’ fits will automatically add width instead of height. Now onto the jacket… Never choose a three button jacket, always go for one or two buttons, and remember that a lower button stance will seem more proportionate to your frame, lengthening your silhouette. Single-Breasted is best because this style provides a cleaner, less fussy outline and the lapel sits lower and narrower which will draw the eye upwards, helping to lengthen your neck and narrow your frame. When it comes to sleeve length, I usually recommend that gentlemen have ½ or ¾ inch of shirt cuff shown under their suit jacket, however a little cheat for a shorter gentleman is to reveal just ¼ inch to make your arms appear longer. My secret tip for jackets on a shorter gentleman is to go for double vents, not only do they emphasise the outside lines of your body to create a longer silhouette but they are also far smarter and more comfortable than single vents so it’s win-win! 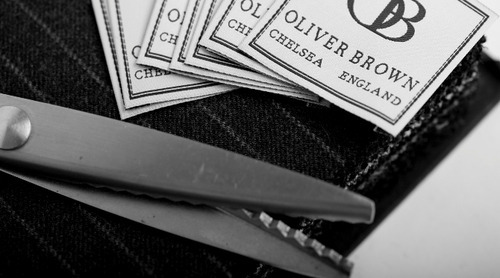 Wear your trousers at the waist, we are traditional at Oliver Brown which suits the shorter gentleman who benefits from a longer leg line; wearing your trousers at your natural waist rather than your hips, will elongate your legs. And don’t wear your trousers too long; bagginess around the bottom of your trouser leg will shorten your silhouette and break up the vertical line. Also, don’t forget to go for plain as opposed to a turn-up finish on your trousers. Colour is another important consideration – darker coloured suits are best at lengthening and our timeless navy and grey city suit cloths are a perfect example. Navy is particularly good as it’s a classic colour and considered particularly complimenting to the vast majority of skin types. When considering pattern, I would recommend avoiding cloths that are too loud, such as a houndstooth, chalk stripe, and windowpane check, as these will draw attention to your smaller frame. You would be best sticking to plain clothes or choosing a subtle herringbone which can soften the look. The most important thing is to feel comfortable in your suit, if you feel good wearing it you’ll be able to walk around with confidence - and that will definitely add an extra inch!